Schools Matter: Does Randi Weingarten think no one is paying attention? Does Randi Weingarten think no one is paying attention? This article is also posted at Defend Public Education! On September 9th, the Answer Sheet ran a column in the Washington Post under the title “What if Randi Weingarten were U.S. education secretary?” The article is an interview with American Federation of Teachers President Randi Weingarten by author C.M. Rubin, author of several education books, two on-line series on global education, and publisher of the online blog CMRubinWorld. She is a Fellow of the Disruptor Foundation. Right off, Ms. Weingarten launches into her usual spin, that, while mistakes were made in education under President Barack Obama and Secretary of Education Arne Duncan with “too many tests” and inequitable funding, things are being “reset” with the Every Child Succeeds Act of 2015. The specifics of the disaster of Race to the Top, especially for low-income school districts that have seen dozens of schools closed and public schools being put on starvation budgets to expand privatization with charters, are not mentioned. According to Ms. Weingarten, U.S. education is on course to a brighter tomorrow with ESSA. Asked, “Does the current state of our underprivileged school systems help foster radicalism?" Ms. Weingarten says she does not know of “any empirical data that would answer your question.” She then makes a series of platitudes about how unfortunate the underfunding of schools in low-income communities is with no mention of who is responsible for this situation. Apparently listening to communities is not part of her job description! This is followed once again with praise that ESSA has returned responsibility for education to the states “including standards and accountability, teacher development and evaluation, and interventions.” In other words, were she to become Secretary of Education, nothing would be done to promote public education on the federal level, but education would now fall under reactionary “states rights” provisions. The interview then goes on to a discussion of the effects of poverty on the education of students from low-income families. Once again she gives a series of platitudes that are a response to the rising opposition to corporate education reform. No mention is made here or in any part of the interview about the role of charters in draining funds from public schools, particularly in low-come communities. Instead, she mentions community schools, many of which outsource support services to nonunion businesses, as one band-aid for underfunded schools. She also says, “testing should not be the be-all and end-all of education”, apparently hoping people have forgotten her active opposition to the Opt Out movement led by parents in various parts of the country. On the next question, Weingarten says teachers are underpaid but does not say what should be done about this. She agrees with corporate education reformers that the teaching profession needs "fixing". As her solution, she cites the AFT’s “Raising the Bar” report of a few years ago that called for all new teachers to pass an exam akin to bar exams for lawyers as a way to “improve teacher quality”. More tests! Tellingly, she cites a poll by TeachStrong as proof that three-quarters of teachers are undervalued in terms of how they are treated and supported. TeachStrong is a coalition of forty businesses (including leaders of corporate education reform) and corporate unions (AFT and NEA) who are providing the education program for a Hillary Clinton administration. Many of TeachStrong's partners are funded by the Gates, Broad, and Walton Foundations. Ms. Weingarten concludes the interview by dodging a question about competition for resources between public, private and charter schools, only stating public schools should be fully funded. 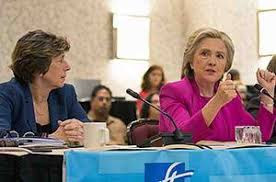 With her early endorsement of Hillary Clinton, Randi Weingarten has been rewarded with “a seat at the table” with other corporate education reformers. The Washington Post interview shows that if she were appointed Secretary of Education, Randi Weingarten would be no different than John King or Arne Duncan. The previous link is discussion of an interview with Rick Hess that Randi Weingarten did before an audience at the right-wing American Enterprise Institute. Rick Hess recently issued a document called The Reform Agenda which Peter Green analyses here: Hess: The Reform Agenda.